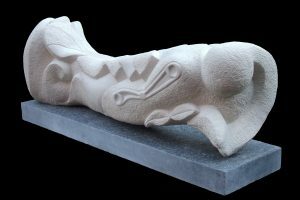 Viv is a sculptor in stone mostly using materials from English quarries. Working with the Shapeshifters Sculpture Group at Dudley College, his current themes are waves, natural forms and narrative sculpture. Hokusai’s Kanagawa Wave has been an inspiration. He has a large body of work based on natural forms, particularly from landscape. 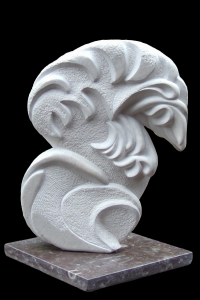 Some sculptures are a collection of forms and verge on the abstract. 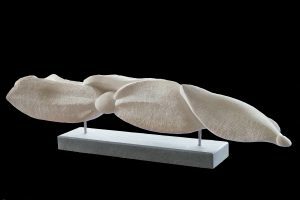 He has worked on sculptures representing narrative such as a piece of music. He has completed three public art commissions including a work commemorating the RAF Boy Entrants at the National Memorial Arboretum. He is active in promoting arts with the White Cone Museum of Glass and is Hon Secretary of the Royal Birmingham Society of Artists. 2018 Finalist for the West Midlands Individual Museum Champion.